Want authentic cedar furniture with an extra gnarly finish? Welcome to Cedar Lake Frontier! 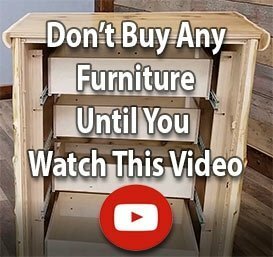 So you’re hunting for real log furniture with a cowboy decor kick, a western decor whap, a country decor, err … heck! Well, get the wood furniture you want and need in Woodland Creek’s Cedar Lake Frontier collection: High-quality handcrafted western furniture beds, country furniture dressers and rustic decor bedroom sets so good looking they’d even make a cowboy blush. Now giddyup! Add extra kick to master bedrooms, kids’ rooms and guest rooms with Cedar Lake Frontier reclaimed wood furniture. Cedar log natural variations – like cracks, beetle holes, checks, warps and knots – give this cottage furniture collection that gently distressed look rustic decorating is known for. Ask about tongue-and-groove paneling, Euroglides, drawer front options and more.